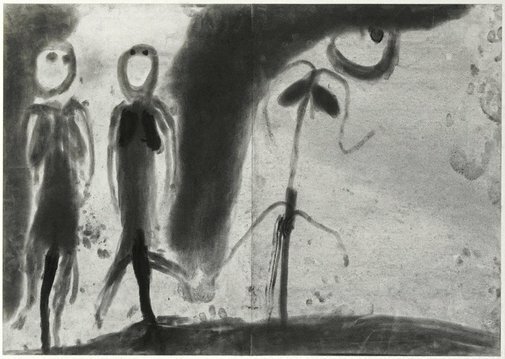 For over 30 years Miriam Cahn has created pictorial and graphic works, largely in charcoal, which have continuously questioned accepted terms of sexuality, gender and power. She has often been connected to the feminist movement of the 1970s with art that specifically addressed a feminist vocabulary and subjectivity. Refining her work in the 1980s, she focused on creating a visual history of women’s space and the female condition. Like American artist Nancy Spero, Cahn has since incorporated imagery that reflects upon political issues such as violence and terrorism. 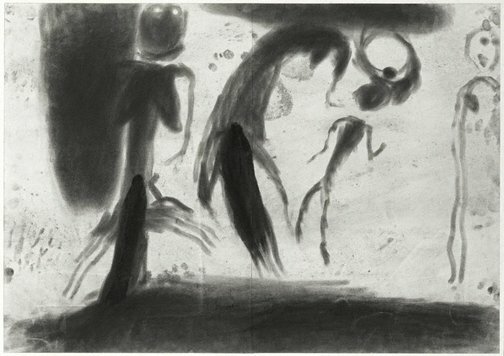 Known for her distinctive depictions of male and female spaces, psychologies and motifs, Cahn refers consistently to her dictionary of symbols and strict method of working to create her charcoal dust pictures. 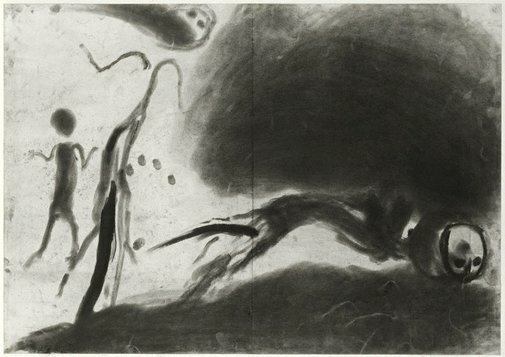 Scheduling the workflow around her menstrual cycle, Cahn firstly creates the charcoal dust by scraping a block with a large knife, a process perhaps of readying her body for the action of drawing. ‘Reading in dust, the wild love’ (also known as ‘Lesen in staub, das wilde lieben’) is a compelling example of Cahn’s visual metaphors for feminine space and language. Drawing directly on paper placed on the floor, Cahn positioned herself close to the earth, drawing with her hands and fingers in the dark. This method enables her to concentrate on the inner psyche with the resulting imagery literally and physically drawn from her body. 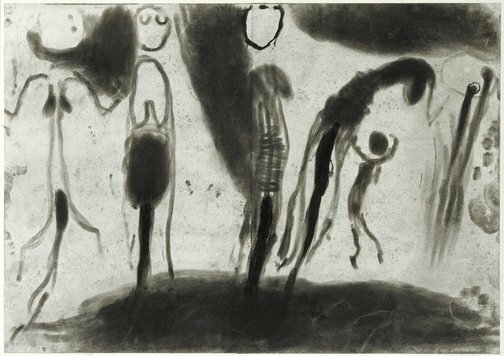 Through a process of psychic and physical transcendence, the figures mould themselves through the action of the artist, who leaves traces of her own body on the paper – fingerprints, footprints, elbow and knee marks. On completion, the charcoal dust is blown away to reveal ethereal figures reminiscent of cave paintings. Her drawings are not stabilised with a fixative; rather the charcoal is left loosely clinging to the surface of the paper reinforcing the temporal nature of human cycles and rhythms, in essence reflecting a circadian diary of the artist’s womanhood. The expressive space of these works incorporates ephemeral marks of violence, whimsy and the abject as mouths spew language, souls or vomit, and menstrual blood pours down to mingle with the earth while children dance and run creating a sense of untamed freedom. The figures are very much attached to the earth: blood returning to the sod with the last image depicting a figure throwing herself to the ground, breasts flying, welcoming the soil connecting with her flesh. Cahn states that she lives and works in a female rhythm – 24 days of work, 6 of rest – this menstrual cycle influencing to some extent the motifs such as houses, animals and children that she incorporates into her work. Cahn considers the figures in ‘Reading in dust, the wild love’ as images of herself and yet they evoke pagan imagery of women depicted in a moment of ecstasy with the earth, breaking free from archetypal paternalistic mythology. Victoria Lynn, Review: works by women from the permanent collection of the Art Gallery of New South Wales , 'Women Artists in the Contemporary Collection', pg.13-15, Sydney, 1995, 14.